UPDATED: Fri., Aug. 24, 2018, 9:06 p.m.
PULLMAN – Rodrick Fisher, a true freshman wide receiver on the Washington State football team who came from Spokane’s East Valley High School, was arrested on a “baby DUI” early Friday morning after registering a blood alcohol level just under .08, the Whitman County Prosecutor’s Office confirmed to The Spokesman-Review. Pullman Radio News first reported Fisher’s arrest Friday morning. In line with team policy, Washington State University doesn’t comment on criminal allegations and a school official told The Spokesman-Review the Cougars would be handling the matter internally. While Fisher’s status with the Cougars remains unclear, a DUI isn’t one of the three acts that automatically gets a player kicked off Mike Leach’s football team. Those are: violence against women, illegal drug use and stealing. Fisher was driving the wrong way on a one-way street in Pullman’s College Hill district when he was pulled over at 12:24 a.m. by Whitman County Deputy Officer Chris Olin. Fisher, 19, was administered two breathalyzer tests, blowing a blood alcohol level of 0.076 on the first and 0.078 on the second. Minors who blow a BAC between 0.02 and 0.08 are cited for what’s commonly known as a “baby” or “minor” DUI. Fisher was arrested and subsequently released from the Pullman Police Department station Friday morning. He appeared at 4 p.m. Friday at the Whitman County Courthouse in Colfax. An early enrollee who joined the Cougars in time for spring camp, Fisher had been on a quick trajectory to earning one of the eight spots in Leach’s wide receiver rotation, which would’ve meant significant playing time as a rookie. Earlier this week, Leach said he’d be one of the two “X” outside receivers in the rotation “if the season started today,” alongside standout sophomore Tay Martin. The 6-foot-2, 195-pound speedster caught three passes for 36 yards and scored a touchdown in the Cougars’ spring game – played at Joe Albi Stadium in Spokane. He hauled in four passes for 43 yards, including two touchdowns, during the team’s most recent scrimmage in Pullman. The story of the East Valley football/track and field star has been well-documented. Fisher spent years of his teenage life bouncing around from home to home – and was homeless at times – before being adopted by EV football coach Adam Fisher and changing his last name from Jackson to Fisher. The WSU receiver told reporters last week arriving on campus early had been advantageous. 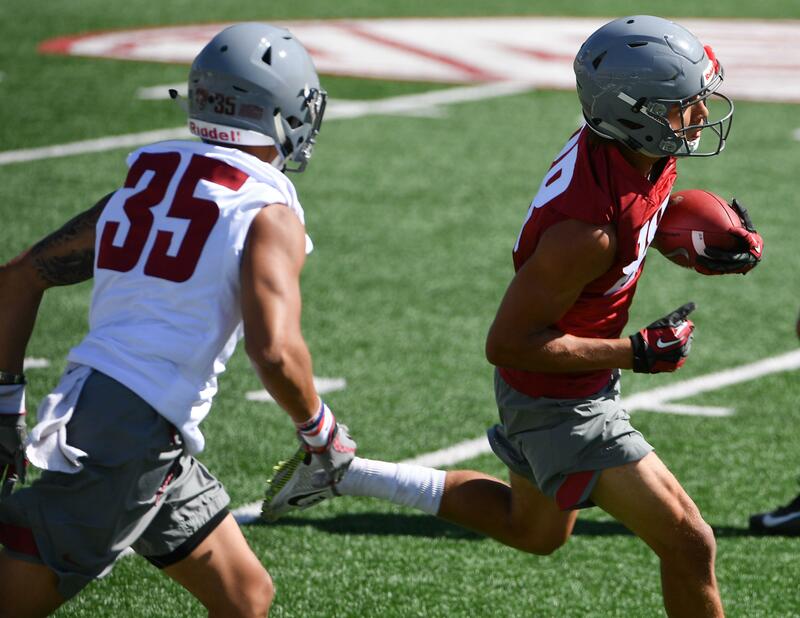 Wide receiver happens to be the deepest position group at WSU, so the Cougars shouldn’t see a significant drop-off if Fisher has to miss any time. Four-star freshman Drue Jackson has spent time at the “X” receiver position, and junior college transfer Calvin Jackson Jr. was getting reps at both outside spots – the “X” and the “Z” – during preseason camp. Published: Aug. 24, 2018, 12:24 p.m. Updated: Aug. 24, 2018, 9:06 p.m.